Linnett Hill017687 44518work Guest AccommodationLinnett Hill is a beautifully appointed period property offering contemporary accommodation in the stunning North Lakeland town of Keswick. Whether walking, climbing, mountain biking, boating, painting, photography, shopping or simply relaxing and enjoying its beautiful scenery, Keswick has everything for both outdoor enthusiasts and tourists alike and is ideal for short or long stays. Built in 1812, Linnett Hill is a Regency property with a unique Dutch façade prominently situated in the centre of Keswick directly opposite Fitz Park and enjoys breath-taking views towards Latrigg and Skiddaw. 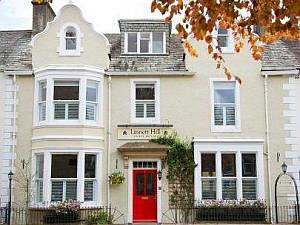 Comprehensively refurbished, Linnett Hill provides modern facilities whilst retaining much of its original character. Linnett Hill offers eight fully en-suite guest bedrooms, feature bathrooms, flat screen TV's, relaxing lounge, wood burning stoves, free Wi-Fi throughout, extensive private parking, secure cycle storage and indoor drying facilities.